Clevedon Christian charity Re:Mission. Vulnerable men who have come through drug and alcohol rehabilitation schemes are offered accommodation and a programme that gives them the opportunity to improve their quality of life, preparing them to live independently. A stable environment is provided at 21 Victoria Road, support is offered and independence is nurtured. There are 11 rooms and the residents are involved involuntary work, training courses, meetings and 1-2-1 sessions with skilled key workers who provide help and support. Several men attend local churches, particularly CBC, Living Waters and St Andrews, and some of the men have helped with the Glebe Project. When the Church Centre was renovated men from Andrew House and ex-residents contributed to the work carried out. For some time St Andrews has supported Andrew House in various practical ways and currently in financial ways as one of our main missions. Money donated has been used to provide “extras” like travel to attend college courses or to visit families, educational fees, equipment for voluntary work and local outings, such as to the SS Great Britain or a walk in the Mendips. At Christmas gifts of food are donated and one year each resident was presented with a chocolate egg at Easter. 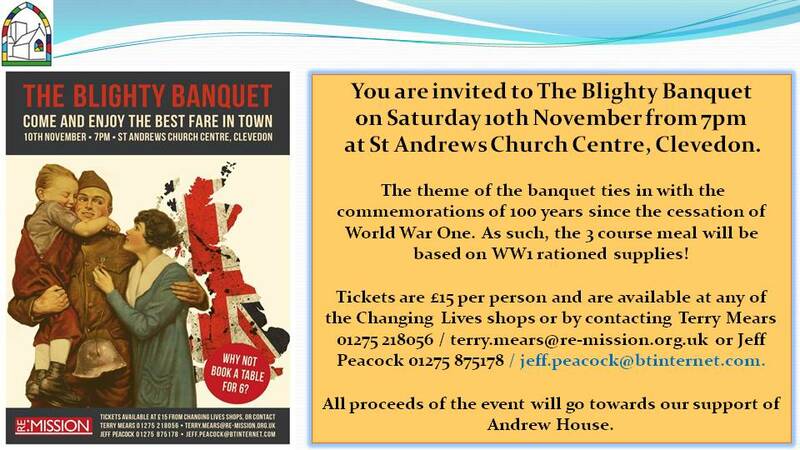 How can YOU help this worthwhile local cause whose work has been praised in the county? Do consider donating to Re:Mission who own Andrew House and are carry out extensive repairs to the house. Why not support associated fund-raising events? Andrew House holds its own events too. Certainly continued prayer support for the men and the staff who live and work alongside each other at Andrew House is very important.